Digital, cutting-edge imaging technologies, such as 3-dimensional tomosynthesis, have already found to be significant in earlier identification and diagnosis of breast cancer. Unlike current mammography systems, which generate a two-dimensional (2-D) image, breast tomosynthesis produces a three-dimensional image. Additionally, it is anticipated that tomosynthesis will enhance new applications, in combination with ultrasound. 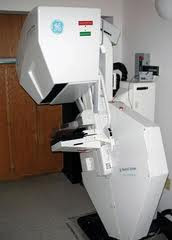 Using current mammography technologies, usually two x-rays of each breast are taken from different angles: from top-to-bottom and from side-to-side. The breast is pulled away from the body, compressed, and held between two glass plates to make sure that the entire breast can be carefully observed. Standard mammography records the images on film, and digital mammography records the images on computer, which can then be read and interpreted by a radiologist. Breast cancer, which is denser than most healthy nearby breast tissue, appears as uneven white areas which are referred to as shadows. Some women cannot tolerate the breast compression component and find it so uncomfortable that they avoid annual or indicated testing. This necessary compression also causes overlapping of the breast tissue. Breast cancer can be hidden in the overlapping tissue and not show up on the mammogram. Mammograms take only one picture, across the entire breast, in the two directions as described above. In this limited way, it is possible to miss cancerous areas or lesions that are too small to detect. Digital tomosynthesis was developed to overcome these limitations. Tomosynthesis takes multiple x-ray pictures of each breast from many angles and the breast is positioned the same way it is in a conventional mammogram, but much less pressure is necessary. Tomosynthesis requires just enough pressure to keep the breast in a stable position during the procedure. The x-ray tube moves in an arc around the breast while 11 images are taken during a 7-second examination. Then the information is sent to a computer, where it is assembled to produce clear, highly focused 3-dimensional images throughout the breast. In this way, none of the tissue is missed as using tomosynthesis, there is no folding or “hiding” of potentially cancerous tissue. Early results with digital tomosynthesis are promising and it is believed that this new imaging technique will make breast cancers easier to see in dense breast tissue and will make mammography screenings more comfortable.